So you want to lose weight and have decided that bouncing on an exercise trampoline is the right way for you. Well, you will probably see results especially if you stick to it and follow good exercises. The great thing about jumping on a trampoline is you can get a cardio workout and still get a weight training workout. The cardio workout will help burn fat while doing it and building muscle will help you burn more fat when not working out. All you need to get started is a top quality exercise trampoline, which you can find a guide to good ones here. You also may want to get some hand weights or ankle weights. Then just turn on some motivational music and start bouncing. And if you are still looking for your first mini trampoline or need an upgrade, visit our mini trampoline buying guide to check our recommendations. The basic bounce can go a long way to help you burn fat. It also is a great way to get your heart beating faster. When exercising you don’t want to go from a resting position to a full blown workout to fast. Instead you want your heart beat to raise gradually. You can bounce normal for the first five minutes or so, and then once you got a little warmed up you can add in other motions. One way to break up the basic bounce is doing jumping jacks. If you do jumping jacks, then you need to make sure your trampoline has a large enough landing area so you don’t get hurt. Basic jumping jacks however is a great way to break up the basic jump. Jumping jacks can also be done with weights to help increases the effect. Another bounce you can do to break up the basic bounce, but still in helping warm up is the core twist. To do this put your feet hip width apart, which is a little closer than shoulder width. You want to keep your core and abs tight and hold your arms up at your chest. You then twist everything from your neck down in a controlled manner. You want your head to stay still and stay looking forward. To help keep your head straight focus on one spot in front of you and twist your torso so it faces each wall. This exercise can be done in thirty to sixty second intervals. Once you got your heart going you can get into other motions using weights or not. The first is the front side arm raise. In this exercise you lift one arm to the side of you as you lift the other in front of you. This helps build the side ab muscles, and also your shoulder muscles. As you do these arm raises you want your feet shoulder width apart with your knees not locked. You want to keep your abs tight and make sure you maintain control with your arms. Keep your wrist straight and do them for thirty to sixty second before pausing or moving to another exercise. So, are trampolines a good workout? Yes! Another one that you can and probably should use weights with is the bicep bounce. This is mixing a bicep curl while bouncing. Keep feet shoulder width apart and double bounce normally in a controlled manner. On the upwards bounce, raise the weights with your hands up to your chest. Then hold until you complete the bounce. Then during the next double bounce lower the weights back down and push the weights behind you a little. The pushing behind you helps engage your triceps. Like all the other exercises keep your core tight, and focus on one spot on the wall. It is important to have proper form and control when doing any of these exercises to prevent injury. You can also do a bicep curl type move while jumping side to side. This one requires to have a larger exercise trampoline so you have more room, but you jump side to side like a skier. You start with legs hip width apart and arms at side. You then start bouncing and whatever side you bounce to you raise that arm like you are doing a bicep curl. You then lower it as you transition to bouncing to the other side and lifting that arm. The bouncing and movement should come from the core and waist. This exercise is best done for thirty to sixty seconds before taking a pause. The last bouncing exercise is the high knees. This is a fast jumping exercise that will really get your heart going. Instead of bouncing you are basically running on the trampoline. As you run you lift your knees up to your belly button as high as you can. You also move your arms back and forth to help with momentum and balance. As you pump your arms you want to make sure you are keeping your shoulders open and also keeping your eyes on a horizontal plan. This exercise will really take the energy from you, so at first, you may not be able to do it long, but try to build up to sixty seconds. There is one other exercise you can do with your trampoline and it isn’t bouncing. That is ab rocks. You lay your back on the trampoline with your legs bent at ninety degrees, and your hand behind your head. Without pulling your head up you begin a rocking motion pulling back with your knees and lifting your chest up, drawing your belly into the rebounder. You just keep going back and forth making sure to keep your knees at a ninety degree angle. Ab rocks will really help your core and is a great cool down exercise. For more info visit our article benefits of using a rebounder mini trampoline. Trampolines can be great exercise, and you don’t need a large outdoor one to get all the benefits. A small indoor exercise trampoline is great to be able to exercise in the comfort of your home while listening to music or watching TV. There are a lot of different exercises you can do on a trampoline, so it keeps things fresh and also helps you have a great cardio workout as long as building muscle. 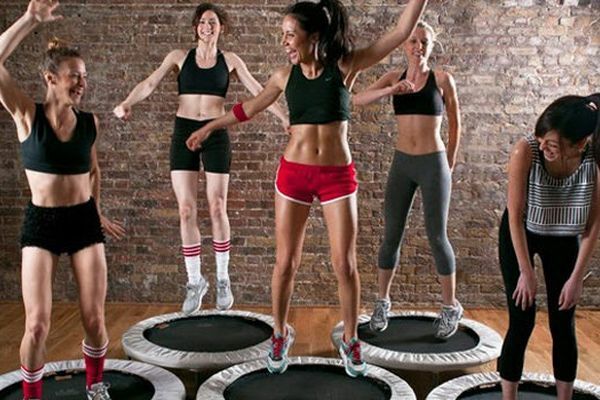 A trampoline exercise trampoline is a lot of fun and will help you burn fat.